Americans are voicing growing discontent with the quality and cost of their health insurance coverage. Nearly one in three voters recently surveyed by Morning Consult said that their health insurance coverage has become worse in the past year, while just 15 percent said that it had improved. Fifty-five percent of those interviewed said they’re paying more for their insurance coverage than the previous year. Twenty-four percent reported that they lost contact with their family physicians because they were out of network and too expensive to continue to use. Perhaps most troubling, 25 percent said that a medical condition got worse after they delayed getting emergency medical care in the past year out of fear their health insurance wouldn’t cover the cost. Kaplan said that insurance companies bear much of the blame for selling policies that force patients to cover so much of their own costs. “Many people … are shocked at how little their insurance pays,” he wrote. 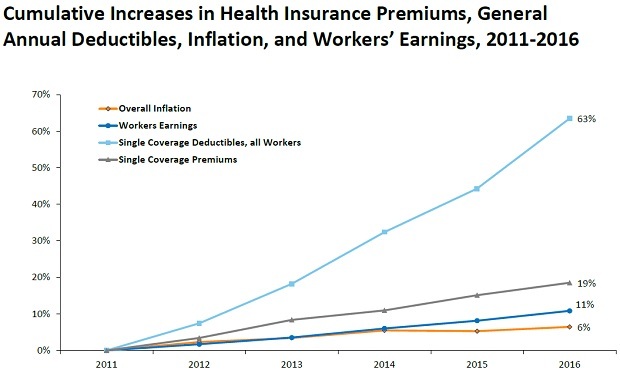 According to the Centers for Disease Control and Prevention, the number of people enrolled in high-deductible health care plans has increased by 40 percent over the past six years, since the enactment of Obamacare, and the deductibles are soaring. Joseph Antos, a health care expert with the American Enterprise Institute, said on Tuesday that consumers are being swept up in an historic shift in the health insurance paradigm since the advent of Obamacare that is prompting many of the complaints.